Not all passes are monthly. Regardless, the factual point was that the number boardings do not equal fares paid, so you can't use that number to calculate revenue. CRail wrote: How do you know what people have? You think students go from their dorms to class and back to their dorms? People who live, work, play, and study in the city with no other form of transportation don't get passes? Well someone should advise them, then. If they go into the city 10-15 times/month (round trips), they're better off with stored value than passes, no? It takes 35 trips on the subway to make a $70 monthly pass worthwhile. Except for students riding every day to a job or class - which, speaking as a student, is a relatively small number of my comrades - paying per ride is much more affordable. Except for BU and Harvard students living in Allston, most students at the large schools around here live close to campus. Don't forget though that most schools offer discounted monthly passes. And many college students work as well. CRail wrote: Not all passes are monthly. Regardless, the factual point was that the number boardings do not equal fares paid, so you can't use that number to calculate revenue. Thank you. If anyone wants to explore the passes/fares, lets move this discussion to the Charlie Card thread. I'm still gobsmacked that our insolvent transit agency would take on additional money-losing service without a specific revenue stream to fully cover the subsidy. They are doing it because they can, while the current administration is in place. That said, add me to the proponents of premium-pricing. Say $4 instead of $2. Later move the premium pricing to anything after 10pm, except commuter rail that is already premium priced. Use the experience to judge cost sensitivity. Collect fares on first night and other events. Increase pricing on Sundays and holidays to cover time and a half and low ridership. If some of that works, start congestion pricing rush hour. Can grannie take The Ride at 3AM now? B+ for rhetoric, F for research. Let me say it for the umpteenth time: This was not the MBTA's decision. This was a political decision, made at the state level and heavily influenced by Menino and especially Walsh. The MBTA does not want late-night service; they would rather run earlier-morning weekday service where there is even higher demand. They are doing the best they can given what they were told to do by the state government. The state government is funding most of the service; with about 10% from corporate sponsors - there should be no direct impact to the T's bottom line. Premium pricing won't work straight off. Let the demand for the service show itself, and once everyone depends on the service you can begin to talk about premium fares. Starting off with double fares is just going to keep more people in the cabs or at home or driving - exactly the opposite intent of extending service hours. If the state truly wanted Boston to become a 24-hour city, they'd throw a few extra millions in the pot and make fares half (or nothing) as an incentive to stay out and ride the T back. Collecting fares on First Night is the stupidest possible thing the MBTA can do. Free rides on First Night are intended to get as many people to where they need to go, and safely. Collecting fares would slow service down, and probably result in more drunk drivers on the road. Transit is not merely a business; it is also a public service and at times the business aspects must be ignored to enhance public safety. The T loses about $580,000 in fares late on First Night; the monetary value of a human life is around $6 million depending on which agency you ask. One less drunk driver death a decade, and every single one of those free fares are worth it. ADA paratransit must operate the same hours as fixed-route service. That's a federal requirement and there's nothing the T can do about that. Paratransit use drops way off after dark anyway - most users are elderly and are much less likely to be out late than the general rider population. The MBTA's control board is considering cutting late-night service on the weekends. Pretty sure weekend commuter rail ridership would go up, up, up if they had trains that left Boston later than 11:30. You really can't plan/do that much for an evening if you have to start making your way back to the station @ 11pm on a Saturday night. Let alone needing to constantly check your watch to make sure you still have time which can really spoil the evening. A 1am departure even without a 12:00 or 12:15 could really incentivize more folks from the 'burbs to stay in the city later and -therefore- to even go in at all. The MBTA is insolvent, so they should cancel money-losing late night service. What have we learned from this experiment? Have statistics been recorded (like on the Cape Flyer)? Did any line come close to operational break even? What were the effects on earlier service? Did late night service stimulate additional ridership during normal hours? Some of the lines can be efficiently bustituted, others especially commuter rail don't quite conform to modern street patterns. What part of "public service" don't you understand? Should we be cutting back on the police force and fire service because departments don't turn profits? Of course the MBTA is insolvent, that's the reason it exists! It's the reason you don't ride Jimmy's Subway train and FasTrack® Trolley Lines, it's not a profitable venture!!! The T doesn't care about what makes the most money, it cares about what best serves its ridership. Its only "customer" is the Commonwealth, and the Commonwealth pays for it. That's why it is the government of the Commonwealth that decides if the service continues or gets scrapped. Enough with the revenue nonsense, no one cares! Boardings count, nickels don't. BandA wrote: The MBTA is insolvent, so they should cancel money-losing late night service. With your logic, MBTA would cancel all service outside of rush hour. 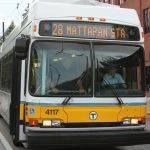 "Members of the Massachusetts Bay Transportation Authority’s Fiscal and Management Control Board on Wednesday seemed open to abandoning the weekend bus and subway service, which runs until 2 a.m. Saturday and Sunday mornings, to cut costs." Actually the last trains usually leave Park Street just after 1 AM anyway (i.e., 1:06 AM), so it's not even an hour extra service. They really don't need very frequent service, trains at 1:15, 1:30, 1:45, and 2:00 might be all that is necessary to serve the late night market. There are enough crossovers to bypass certain stretches of track or shuttles could be set up if extensive repairs have to be done somewhere. bostontrainguy wrote: "Members of the Massachusetts Bay Transportation Authority’s Fiscal and Management Control Board on Wednesday seemed open to abandoning the weekend bus and subway service, which runs until 2 a.m. Saturday and Sunday mornings, to cut costs." And, by that logic, can we close down the MassPike at night when traffic is light? jamesinclair wrote: With your logic, MBTA would cancel all service outside of rush hour. The "T" started the late-night service, knowing that they had a huge deficit and knowing that late-night would be a big money loser. It was obvious from the start that this would get canceled when the "demonstration" funds ran out. Where I live, taking the "T" any time other than rush hour is a huge pain. Although I wouldn't go that far, that is the logical conclusion. octr202 wrote: And, by that logic, can we close down the MassPike at night when traffic is light? No, but we should either remove the tolls or impose them on I-93. Demand pricing of toll roads is another possibility, where it is free at night but double at rush hour. Interesting that you mention a profitable toll road that follows roughly the same route as the money-losing Framingham-Worcester commuter rail. Yet both are packed to overflow at rush hour. You are looking at the public schedule. As I said, the trains actually leave after 1:00 AM during the week. Late night service is only about one hour later. They could reschedule all last trains to leave Park at 2:00 AM and close everything down about 1 hour later than usual.